On 2 March 2013 a referendum in Switzerland came out in favour of tougher rules on the setting of managers’ remuneration. 68% of the voters wanted to put limits on “rip-offs” – in other words, the millions handed out in bonuses and severance payments (golden parachutes) to top managers. Coming up are further referendums on limiting top incomes and setting a legal minimum wage. Since the turn of this century, remuneration packages for top managers in Switzerland have soared to several million francs. The CEOs and Chairmen of public companies, particularly the major banks and pharmaceuticals firms, have been pulling in sums that are really only comparable with those in the USA. Ten years ago, this was already causing strong public discussion. The debates grew even fiercer when the million-franc payouts continued through 2009, despite the financial crash and the collapse of previously good business results. In this situation, a People’s Initiative launched by small-scale entrepreneur Thomas Minder took on particular significance. It called for Swiss company law to be changed so that the power to set executive pay was transferred to shareholder meetings. And it advocated a ban on golden parachutes. The majority of parties and business organisations, and consequently also parliament, rejected the Initiative and wanted to give the shareholder meetings purely consultative rights. The Left and the trade unions criticised the Initiative for aiming simply to transfer the decision-making powers to the shareholders. So the Left and the unions sought to have the highest incomes more heavily taxed, in order to make them less attractive to firms, but they did not secure a majority in parliament for this proposal either. Finally, in 2013, the People’s Initiative was put to a referendum. The campaign leading up to the vote was hard-fought. The peak business councils spent millions of francs in a bid to get the Initiative rejected. They argued that it would put firms in a straitjacket and cause the delocalisation of company headquarters. Backing a “yes” vote were the initiator, the Social Democratic Party, the Greens and part of the trade union movement. The referendum result was an overwhelming 68% in favour. But if the great majority of the voters said “yes”, this was less about the new division of powers than about sending out a strong signal against “rip-offs”. And that signal was heard far beyond Switzerland’s borders. Now, the Swiss Parliament will have to adopt the appropriate legal changes, which should come into force as early as 2014. Meanwhile, another People’s Initiative on the problem of the wage gap is soon to be put to a referendum. Drawn up and submitted by the Young Socialists of Switzerland, it stipulates that the highest remuneration within a firm should not be more than twelve times the lowest wages paid. So the thrust of this Initiative is towards a binding reduction of top pay and an increase in minimum wages. This proposal is supported by the trade unions, the Left and the progressive Greens. For the great majority of enterprises, the “1-to-12 rule” would mean no change at all. Almost all workplaces within the domestic economy have far smaller wage spreads than that. Until recently, the bosses of the big state enterprises (the railways, the post office, telecommunications) also earned less. In these sectors, it was not until privatisation that the brakes came off. However, for a few hundred firms, notably those that are export-oriented and quoted on the stock exchange, acceptance of this new pay ceiling would mean severe restrictions. The referendum on this Initiative will probably be held in September 2013. Finally, preparations are under way for a vote on yet another People’s Initiative. This one is about the introduction of a legal minimum wage. It was launched by the Swiss Federation of Trade Unions, as collective agreement coverage in Switzerland has been stagnating at around 50% and some of the agreements do not even specify pay rates or minimum wages. The Initiative calls for a national minimum wage of SFr. 22, which is equivalent to 61% of the Swiss median wage. It also provides for cantons with above-average living costs to bring in supplements. The employers and the majority of the parties are against a legal minimum wage. They point to Switzerland’s tradition of collective agreements – but without addressing the issue of those agreements’ limited coverage. The referendum on this is like to be held in 2014. Note on People’s Initiatives: In Switzerland, 100,000 signatures (about 2% of citizens entitled to vote) are sufficient to demand a popular referendum on changing an article of the Constitution. If a majority of the votes cast is in favour, parliament is required to draw up the corresponding legislation. 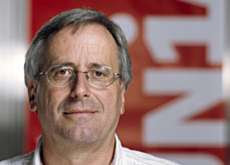 Andreas Rieger is National Secretary of the Swiss trade union UNIA and member of the Executive Committee of the European Trade Union Confederation. For more information see the following links. Please note that while all the websites are in German, they all have other language options. However, only the first one includes English in that list.